High mammographic breast density is associated with increased risk of breast cancer, but how risk varies with longitudinal change in density is less clear. To investigate, a case-control study of 30 women with screen-detected cancer and 30 women with a normal mammogram, all with two previous normal mammograms, was conducted. Percentage density for all mammograms was estimated with the thresholding software Cumulus. Mean density at first screen was not significantly different in cases and controls in contralateral (36.5 vs. 32.6, p = 0.23) or ipsilateral (36.0 vs. 32.9 p = 0.37) breasts, but mean reduction in density from first to third screen was significantly different in both contralateral (10.7 vs. 5.1, p = 0.02) and ipsilateral (11.7 vs. 6.2, p = 0.04) breasts. 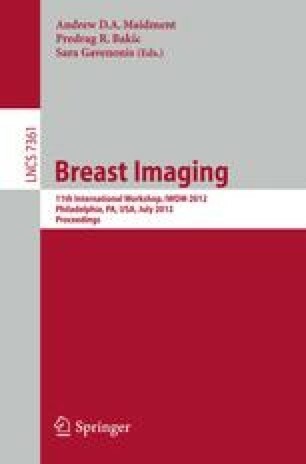 Using logistic regression, and controlling for age and HRT use, breast cancer risk was found to be associated with change in density from first to third screen.